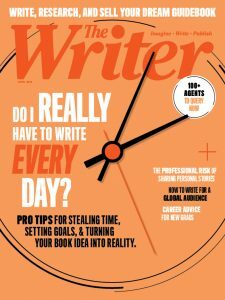 The writers in this issue are known for the power stories they write and the powerful ways they pull us toward their ideas. We travel with them to worlds beyond our own imaginations. And sometimes to worlds buried deep in the recesses of our imaginations. Editor-in-Chief Alicia Anstead interviewed novelist Glen Duncan in New York City. Photo by Juan Padron. The night I met up with novelist Glen Duncan, snow was pounding down in New York City. An eerie patina bathed the streets, and the chill was driving people indoors. The evening seemed less crowded than usual: a quick seat in the bar, instant table at the restaurant, fast service. I noticed these details because of Duncan’s book By Blood We Live. The book is about vampires and werewolves and lunatics (literally), and all of that had made its way into my forward imagination. Which means I was thinking about the book whenever I wasn’t reading the book. I found myself wondering: What if? That heightened sensibility comes with reading certain books. Certainly, Stephen King and Tom Robbins (featured in this issue). But also Toni Morrison. Jess Walter. Jane Austen. John Irving. Ayana Mathis (also featured in this issue). Oh, the mind is an impressionable place. And when a story infiltrates the imagination, my mind is willing. How do writers do that? How do they take us into stories so that we surrender our inner worlds to them? This issue addresses those questions in nearly every feature. These writers are known for the power stories they write and the powerful ways they pull us toward their ideas. Sherman Alexie. Jean Kwok. James Joyce. Robbins. Duncan. We travel with them to worlds beyond our own imaginations. And sometimes to worlds buried deep in the recesses of our imaginations. How do you, as a person of craft, tap into that? We hope every story in this issue helps you answer that question – or helps you pose new questions and discover untested pathways to the magic of words. In the meantime, watch your back. No one really knows what lurking inside that book you’re reading … or writing. Either way, good luck.